In order to have a more organized family life, I came up with a 4 week meal schedule. Every Monday we have soup for dinner. Suzanne is hosting a "Simply Lovely Soups Fair." Here are a few of my favorite recipes. Saute onions and garlic in drippings. Stir in water, wine, tomatoes, carrots, basil, oregano, tomato sauce, and sausage. Bring to a boil. Reduce heat; simmer uncovered for 30 minutes. Skim fat from the soup. Stir in parsley. Simmer covered for 30 minutes. Add tortellini during the last 10 minutes. Sprinkle with Parmesan cheese on top of each serving. Pour in the beans, diced tomatoes and tomato paste. Add the onion, green and red bell peppers, chile peppers. Season with chili powder, Worcestershire sauce, garlic, oregano, cumin, basil, salt, pepper, cayenne, paprika, and sugar. Stir to blend, then cover and simmer over low heat for at least 2 hours, stirring occasionally. To serve, ladle into bowls, and top with corn chips and shredded Cheddar cheese. Combine the potatoes, celery, onion, ham and water in a stockpot. Bring to a boil, then cook over medium heat until potatoes are tender, about 10 to 15 minutes. Stir in salt and pepper. For some gardening is a labor of love; for others it’s a nightmare. And understandably so on both counts. What could give one more satisfaction than gathering one’s family around a table adorned with fresh cut flowers from the garden for a homecooked meal of homegrown food that took months cultivate, and that everyone thinks is delicious!? On the other hand, who wants to spend at least an hour or so every day slaving away under the hot sun, in the dead of summer, pulling weeds, staking up tomatoes, picking bugs and worms off vines, watering, fertilizing, pruning, and waiting for flowers to bloom and fruits and vegetables to ripen, hoping all the while that they’ll be good enough to have been worth so much trouble? There was a time, however, and not too long ago, when raising one’s own crops was a way of life and absolutely necessary for survival. Just think of the pioneers; or the peasants in a medieval village. If you didn’t work you didn’t eat. And individuals seemed to appreciate what they had so much more than we do nowadays. The reality is that gardening provides much more than just decorations for the home or sustenance. We find in gardening a spiritual exercise which, through it’s inherent cooperation with the Divine, cultivates in our souls—our spiritual gardens—countless virtues, but particularly the four theological virtues of Prudence, Fortitude, Temperance and Justice. It’s a tricky business knowing just when to plant. Prudence dictates that we draw from our own experience as well as that of others, research past years’ weather patterns, and call on a little help from God ("Please let this be the last frost!") in order to save ourselves a lot of time and money, both of which most of us have precious little to spare. It is certainly none other than the virtue of fortitude that pushes us through the unpleasantly hot days of summer, to every day tend to the creation God is unfolding before our eyes, working as good stewards of the Earth to bring it to its full potential. Temperance is what keeps us from plucking the fruits of our long labors before their time—or over watering or fertilizing in the hopes that we can enjoy the fruits sooner than God has ordained. Justice, that tedious virtue parents are called upon every day to administer is perfectly realized at that blessed moment when the "nightmare" transforms into the labor of love and at last one may share and enjoy the fruits of one’s labors. The better you practiced the other three virtues, the greater your reward. The more you put into it, the more you get out of it. How true this is of our relationship with God, as well. Which brings me to my final point. One cannot ignore the intimate partnership that exists between gardener and God, without whose provision through His mistress, Nature, no amount of hard work on the part of the gardener will produce. But when God and Man cooperate, it takes only a few months to enjoy the reward of that tiny glimpse into the Garden of Eden, exploding with the abundance of God’s creation—birds, flowers, berries, veggies—all that is good for man’s body—the evidence of the good that has been worked in his soul. Check out Joy In The Morning to read how Loni practiced fortitude (and enjoyed it!) through the hot, hot Michigan summer. Learn to appreciate "company" in your garden the way Dawn does By Sun and Candlelight. See just how well one family and God cooperated this summer In The Shade of The Old Oaks! And behold my Husband’s pride of the garden this year at Just Another Day In Paradise. If you’re now wishing you’d planted this year, it’s not too late! There’s a whole list out there of seeds you can plant now! Or you can always read The Carrot Seed, Miss Rumphius, or Jack and the Bean Stalk if you’re more into vicarious gardening! Finally, a toast to all our children, the prettiest flowers of them all! 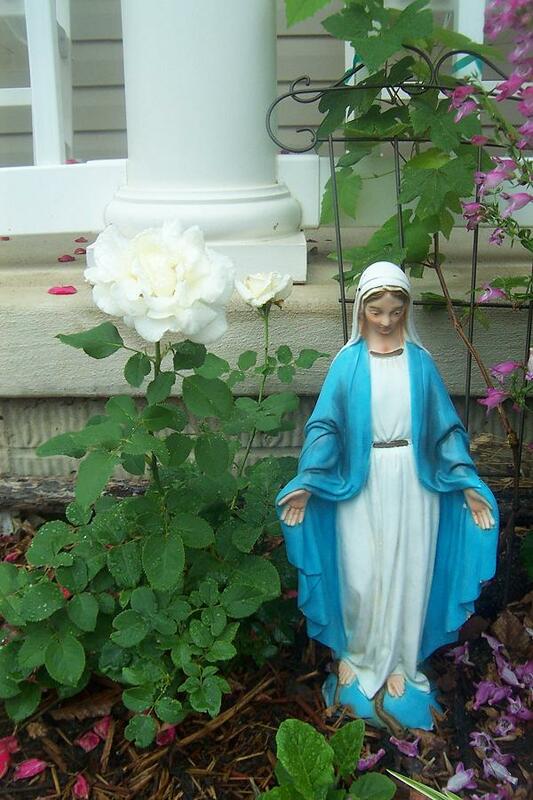 Here is our Pope John Paul II Hybrid Tea Rose we planted in our Blessed Mother’s garden this past spring. This rose has the most amazing scent. 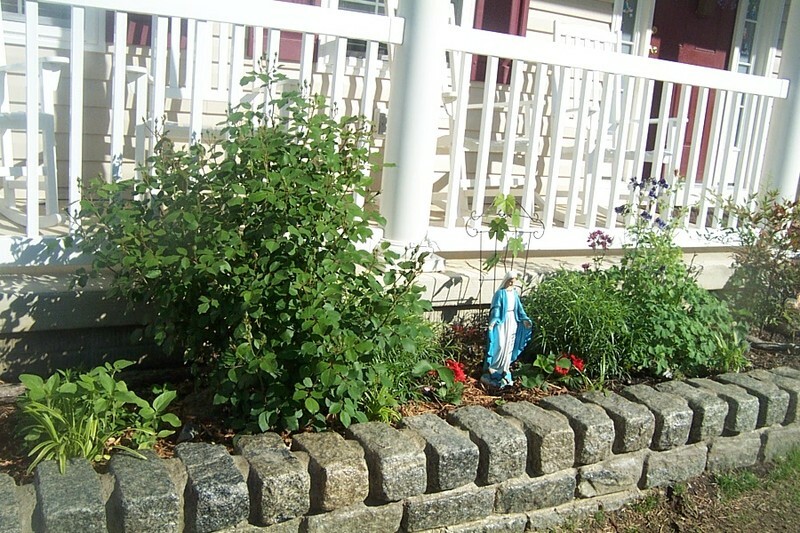 Behind Our Lady my husband planted a grapevine which he says reminds him of Jesus in the Gospel of John 15:5. In this garden we also planted Columbines, a Bleeding Heart, Veronicas, Sunflowers, and Our lady of Guadalupe Roses. Each flower is as big as a small coffee saucer plate and there are so many unopened buds left to go! The flowers are so top heavy that the stalks need to be staked and tied so that a strong wind will not knock them over. We thought this plant had not survived winter, but then we saw small green sprouts coming up in the Spring. 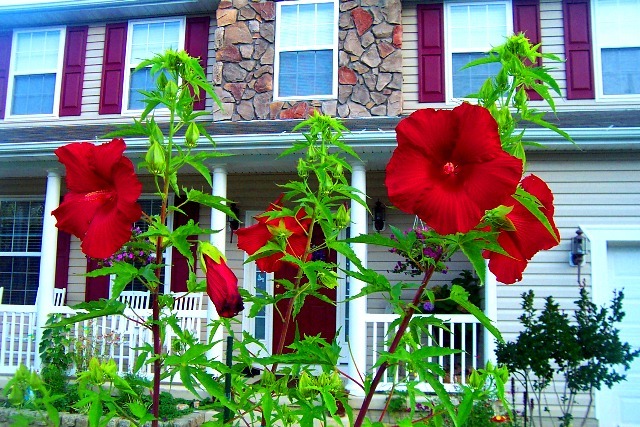 It has since grown to over 7 feet tall and the first blooms opened up so high that they were over my head. This Hibiscus should continue to bloom well into August. The next highlight to emerge soon will be the Crape Myrtle, which can be seen in the lower right hand corner of this picture. If it is anything like last year, then it should be quite a show as well. 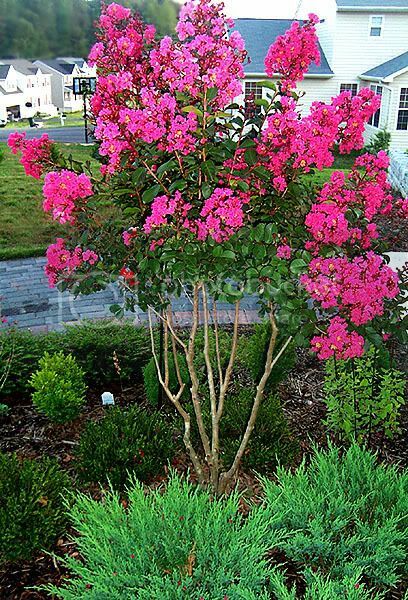 God bless flowering shrubs and trees! 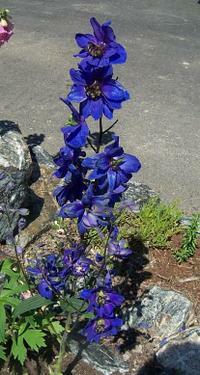 They bring so much life, color and character to any yard and the birds love them too. I didn’t realize how many purple flowers we had in our flower beds, until I started taking pictures for this wonderful "Loveliness Fair" being hosted by Jennifer at As Cozy As Spring. 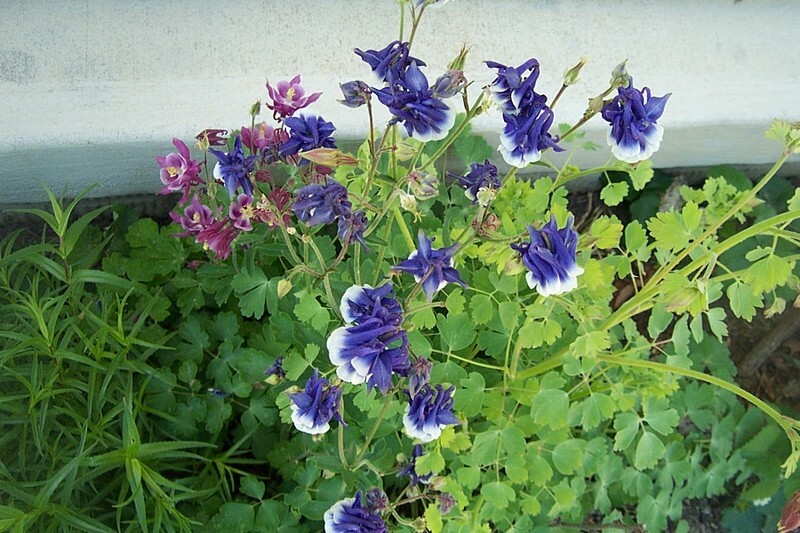 Here are 2 Columbine plants I purchased on clearance last year for .75 each. They have gotten so big already. They are at least 2 feet tall right now. I love Verbenas. They spread very well throughout the ditches in the front yard. 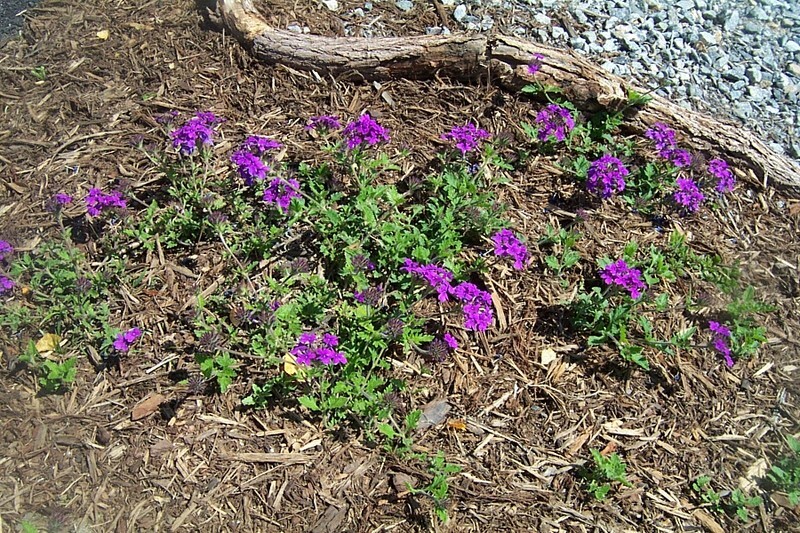 This purple Creeping Flox did very well through the winter, even blooming later in the season. 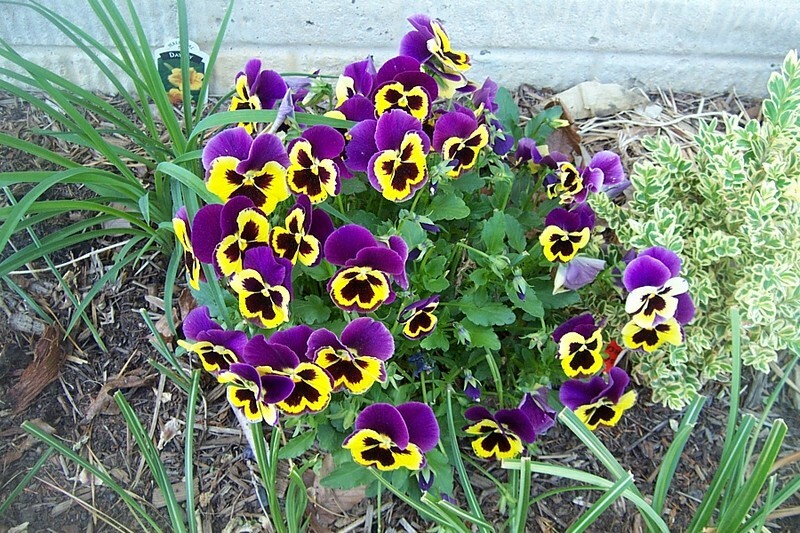 I got these Pansies for my birthday last year, and so far they are doing very well. Here are two different Delphinium plants I just bought to give the "Rock Garden" height. 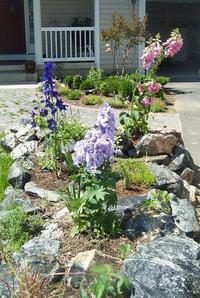 We have a quite a few flower beds in our yard, because we’ve had a hard time growing grass where we live. Most of our front yard is taken up by flower beds and a few flowering trees we purchased last Spring. 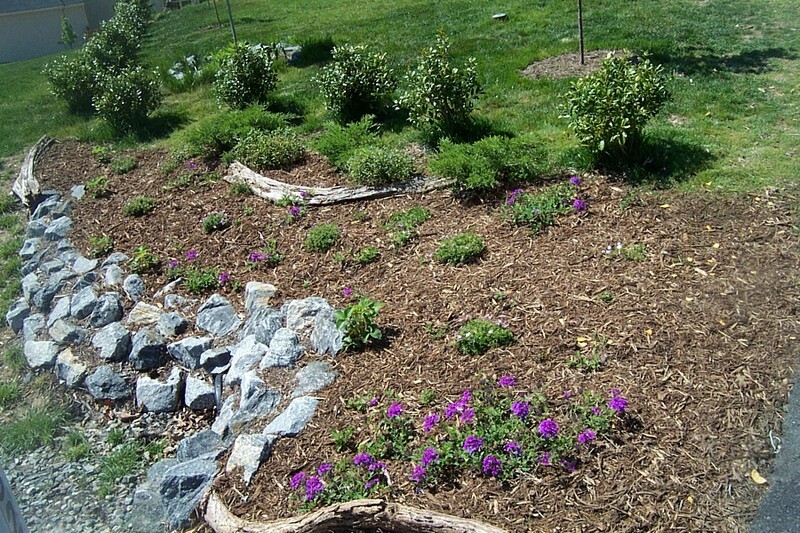 Here is our "Hummingbird Garden." This picture was actually taken last Summer, but I just had to add it in, since it’s such a stunning little tree. The tree and the Hummingbird plants should bloom sometime in the Summer. This is the ditch in front of our house. My husband planted all those Hollies going all the way to the side of the house. 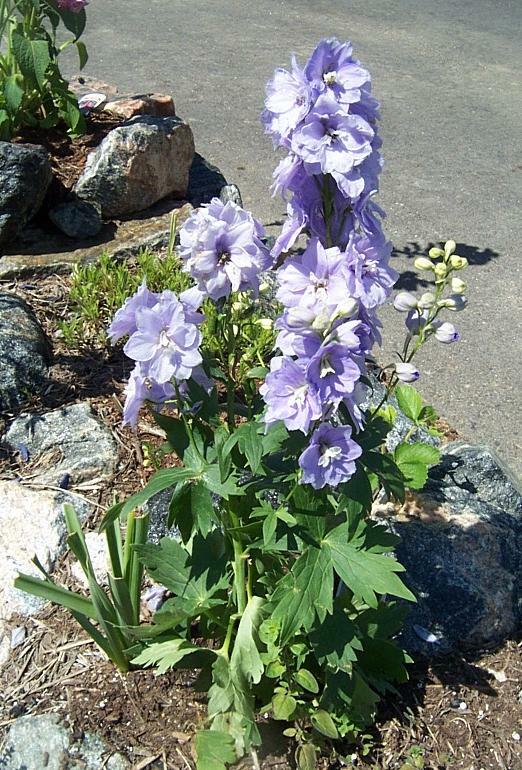 We have Creeping Flox and Verbenas all throughout, hoping they will spread all over. It’s better than the tiny little rocks we had when we moved in. 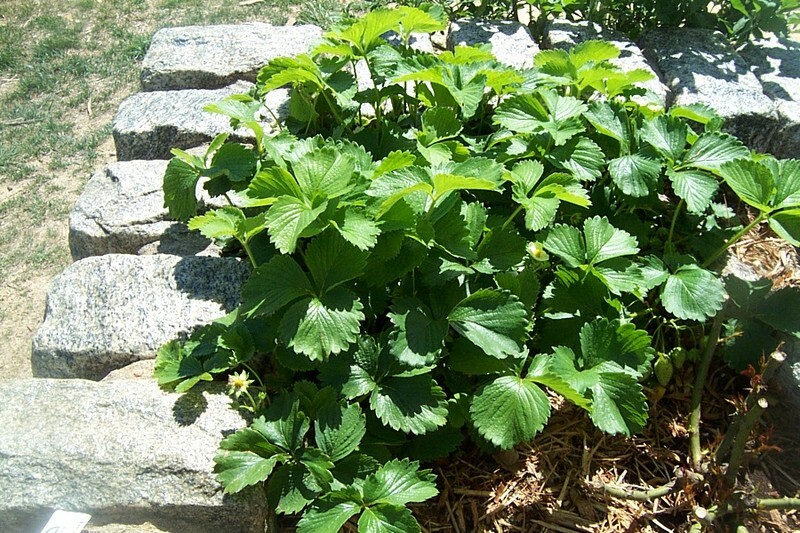 Here is a small strawberry patch we have in the Blessed Mother’s garden. You can see some strawberries already growing on the bottom right.